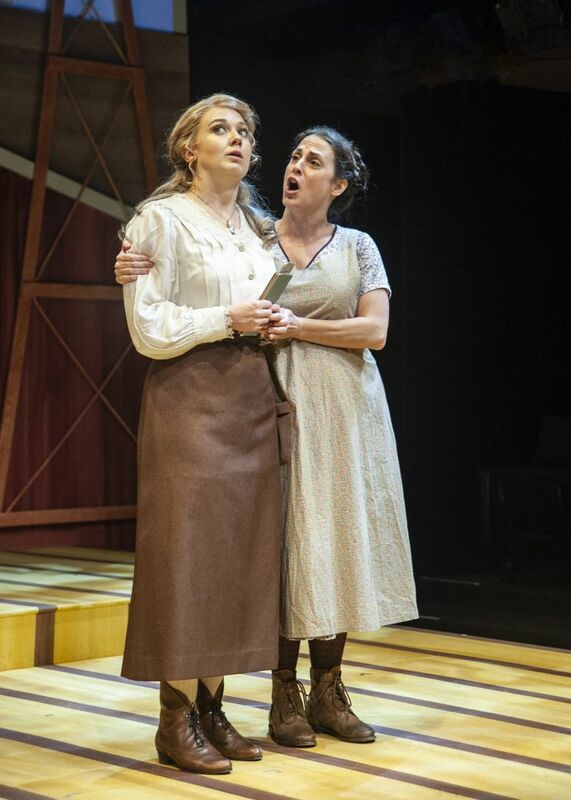 Compact, folksy musicals set in rural America are a specialty of Taproot Theatre. And the show “Sweet Land” fits right in at the company’s Greenwood playhouse. 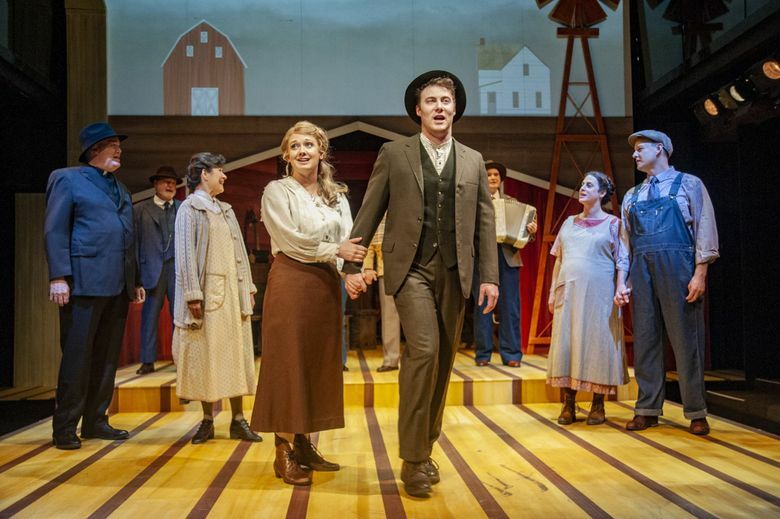 The well-cast, engaging chamber musical features an appealing romance, down-home characters and some vigorous Minnesota wheat threshing. And, not surprisingly, it reaps a happy ending. The fresh arrival in Park Rapids, Minnesota, is Inge Altenberg (Molli Corcoran), a young German native sent abroad by her Scandinavian employers as a mail-order bride for their son Olaf Torvik (Tyler Todd Kimmel), a shy bachelor farmer. It is 1920, and America is still mourning the losses of its sons to German forces in World War I. So the vivacious, non-English-speaking Inge is greeted with suspicion and resentment — so much so that her pending marriage to Olaf faces unexpected hurdles. In our current era, it isn’t a stretch to imagine this sort of nationalistic (though in this case, nonracial) bigotry. And it surely did exist in the American Midwest of the past, as explored in Will Weaver’s “A Gravestone Made of Wheat,” the short story that is the basis of the musical “Sweet Land” as well as an indie film of the same title. These conflicts unfold in tandem with the quietly evolving relationship between Corcoran’s vivaciously appealing Inge and Kimmel’s initially introverted and taciturn Olaf. These two players have fine chemistry, and convey the incremental moments (amusing and serious) that draw this prearranged couple slowly together. Local stage regular Corcoran impressively alternates between speaking fluent German and halting English with (apparent) ease. Moreover, her luscious singing voice lends heft to a score that leans the most on Inge, as in the lovely “Peace and Quiet/Northern Lights” ballad, the whimsically comic “Ducky” and “Call Me Inge Torvik,” a defining trio that also features Hastings’ rich baritone. But in a show about community, it’s fitting that much of the score is sung by the full 10-member ensemble, which also includes the buoyant Chris Shea and April Poland as Inge’s first real friends in her new homeland. Taproot’s capable resident director Karen Lund again smoothly fits a good deal of action (and a bit of energetic dancing) onto Taproot’s small stage. And Mark Lund’s scenic design uses a playful animated projection to suggest the terrain of Minnesota wheat country. Though it generally avoids sinking into mushy sentimentality, “Sweet Land” does unnecessarily tie together every strand of strife in a neat bow at the end. That includes the fate of the Torvik farm — at least until 1975, when it is in the hands of a grandson of Olaf and Inge. And what of the uphill struggles facing family farms and many immigrants in today’s America? That’s a musical we haven’t seen yet.